Drag queens, comedians, singers, and BenDeLaCreme—oh my! 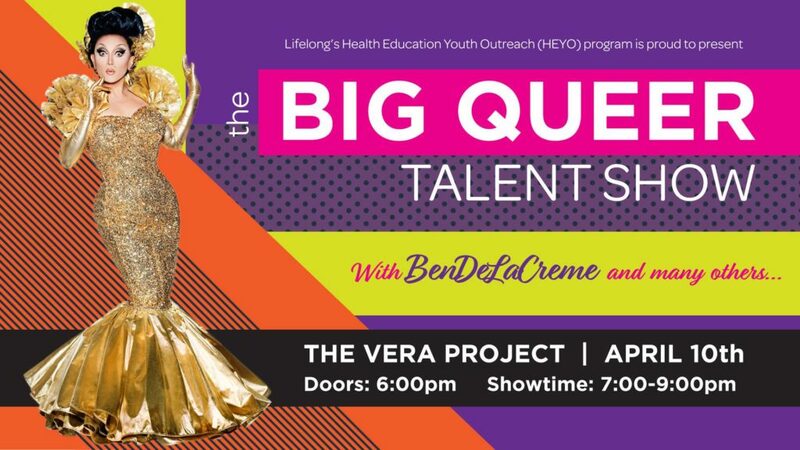 Lifelong’s Health Education Youth Outreach (HEYO) program is proud to present “The Big Queer Talent Show.” This showcase of local Seattle talent—including RuPaul’s Drag Race star BenDeLaCreme—will produce an evening of stunning performances and heartfelt conversations, as we center performers reflecting on their adolescence and growing up as queer men. Kicking off Lifelong’s Health Education Youth Outreach programming and honoring Youth HIV Awareness Day, the event sheds light on the joys and struggles of queer adolescence, and what we, as a community, can do to address the needs of young queer people. Admission is free to the public. The first 50 young people (24 and younger) to attend receive a meet and greet experience with BenDeLaCreme. Light snacks will be provided. This is an all ages and alcohol free event.